Plutocratic Class Warrior Stephen A. Schwarzman: Public Impoverishment When Such An Individual Gains The Economic and Political Upper Hand? 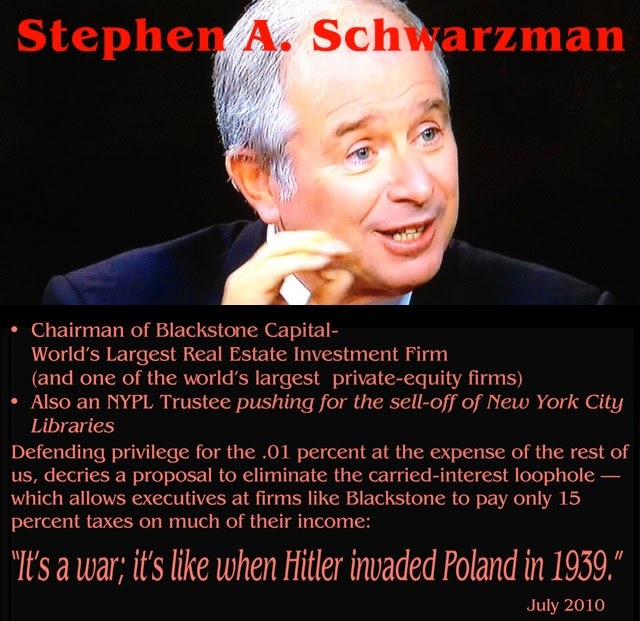 Stephen A. Schwarzman sees himself on one side of a class war, where when it come to protecting the preferential tax breaks he receives the rest of us are like Hitler. You wouldn't think [Schwarzman would] have much to complain about. But, to hear him tell it, he's beset by a meddlesome, tax-happy government and a whiny, envious populace. He recently grumbled that the U.S. middle class has taken to "blaming wealthy people" for its problems. Previously, he has said that it might be good to raise income taxes on the poor so they had "skin in the game," and that proposals to repeal the carried-interest tax loophole-from which he personally benefits-were akin to the German invasion of Poland. Is the bottom line that the wealthiest in society like Schwarzman should be living in fear that the political upper hand will be seized by those who will tax the rich (or simply eliminate the loopholes by which Schwarzman pays his income taxes at a preferential lower rate) to dispense “largess to the poor” or other strata of our society? Au contraire! While class warfare is real, is not a matter of what the wealthy might fear from the rest of us, but what the rest of us have to fear in the way of predation from the likes of Schwarzman: What do individuals such as Schwarzman do when they have the political and the economic upper hand? Schwarzman, who has focused on profiting from buying homes of owners defaulting in the face of economic downturn, has in his role as New York Public Library trustee pushed for the selling and shrinkage of New York City's libraries, he has enthusiastically promoted investment in the environmentally costly practice of hydro-fracking with all its global-warming implications, he has invested in privatizing prisons and now, as is getting attention, we find that he has in a major, very nontransparent way been taking advantage of pension funds, including those of public employees. Some of the pension fund handed over to Schwarzman's Blackstone were set up for the benefit of New York City and New York State employees. In “Wall Street,” the 1987 film famous for its “Greed is good” Gordan Gekko character played by Michael Douglas, a key part of the plot is the disclosure of the unscrupulous lengths to which Gekko will go in dismantling an airline company, putting its employees out of work, in order to raid its pension fund. The mindset epitomized thereby: An economic framework that works for and benefits a larger segment of society is up for grabs to be destroyed by monied interests playing an insider game to pile up ever greater wealth. That was the 1980s. The following story by David Sirota at PandoDaily is simply excellent. It zeros in on the secretive and rapidly expanding relationship between private equity firms and the public pensions that invest in them. It shows a crony capitalist love affair greased by lobbyist influence peddlers known as "placement agents", as well as non-public agreements between PE firms and public pensions chock full of conflicts of interest, extremely high fees and underperformance. Unbelievably, in many instances the trustees of the public pensions are not allowed to know what funds the "fund of funds" invest in. This makes due diligence impossible, and in one particularly egregious example it led the Kentucky Retirement Systems to unknowingly invest in SAC Capital despite the fact it was under SEC investigation at the time. Furthermore, with the Wall Street Journal reporting back in 2011 that $37 of every $100 dollars invested in Blackstone's investment pool comes from state and local pension plans, it appears that taxpayers are once again being fleeced by the financial oligarch class. The chief villain in this article will be no stranger to readers of this site. It is Blackstone . .
An increasing number of those pension funds are being stealthily diverted into high-fee, high-risk "alternative investments" that deliver spectacular rewards for the Wall Street firms paid to manage them - but not such great returns for pensioners and taxpayers. Taken together, the documents raise serious questions about whether the government employees, trustees and politicians overseeing major public pension funds are shirking their fiduciary responsibilities under the law when they are cementing "alternative" investment deals. These pension fund investments were not performing well because of the debilitating effect of high fees. Around the beginning of 2008 Blackstone launched its hedge funds; with a “fund of funds” approach where it steered clients’ money into other hedge funds in return for an additional fee. Blackstone was guaranteed whopping fees of 50 basis points plus 10 percent of any overall profits on retirees' money. In addition, the memo estimates 1.62 percent management fees and 19.78% incentive fees to be paid on top of the Blackstone fees to the underlying (and undisclosed) individual hedge fund managers in the "fund of funds." Pension officials made the decision to invest in the fund despite Blackstone then reportedly being under SEC investigation. The Sunday’s New York Times Business Section of a week ago featured, front page, above-the-fold, a comprehensive article that, in just slightly more tempered New York Timesian business lingo, covered much of the same ground, with a few additions, as the Pando and Zero Hedge articles from last May. 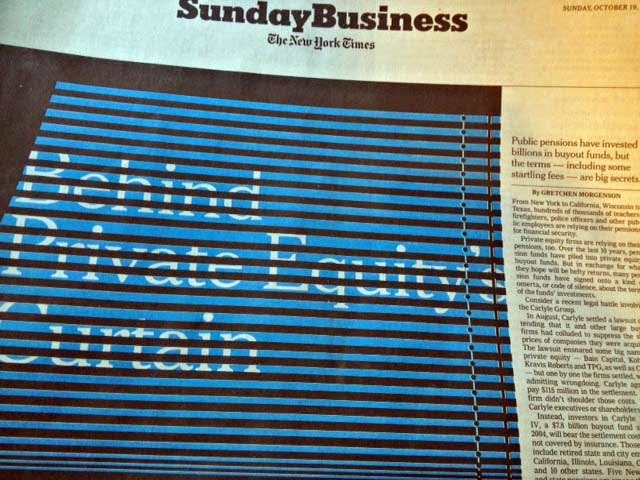 See: Behind Private Equity’s Curtain, by Gretchen Morgenson, October 18, 2014. 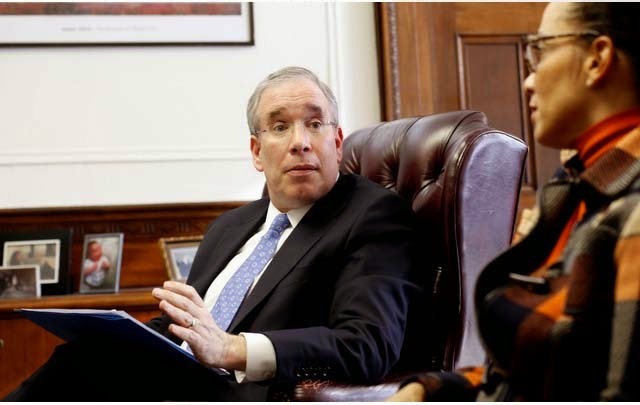 We’ll come back to ways in which that article, illustrated with a photo of New York City Comptroller Scott Stringer and featuring a quote from him, brings the question of these investments closer to home for New York taxpayers. First, it would be worthwhile to note the way the compounding effect of `fees,’especially any accumulating proliferation of them, work to seriously gut an intended building up of retirement investments. To say that “fees” are being charged might imply that valuable services are delivered in exchange, but, bottom line, one ought to suspect and fear the opposite. PBS’s Frontline covered this point well in “The Retirement Gamble” (transcript is available). MARTIN SMITH: Bogle gave me an example. 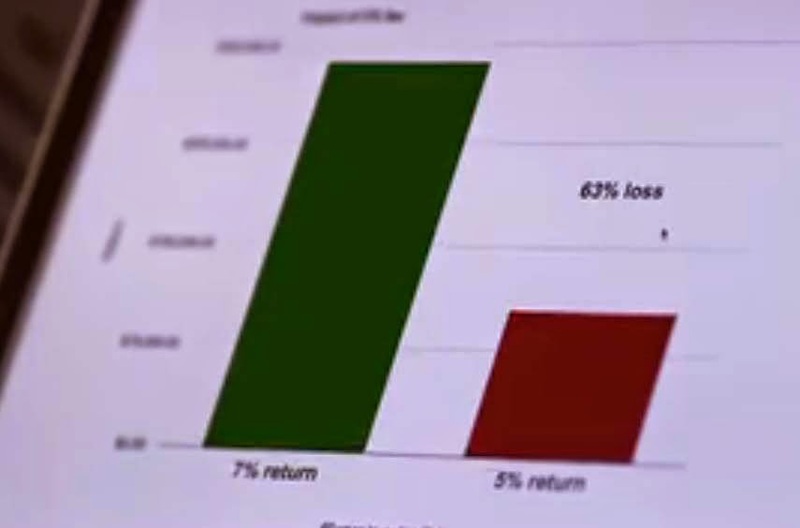 Assume you're invested in a fund that is earning a gross annual return of 7 percent. They charge you a 2 percent annual fee. 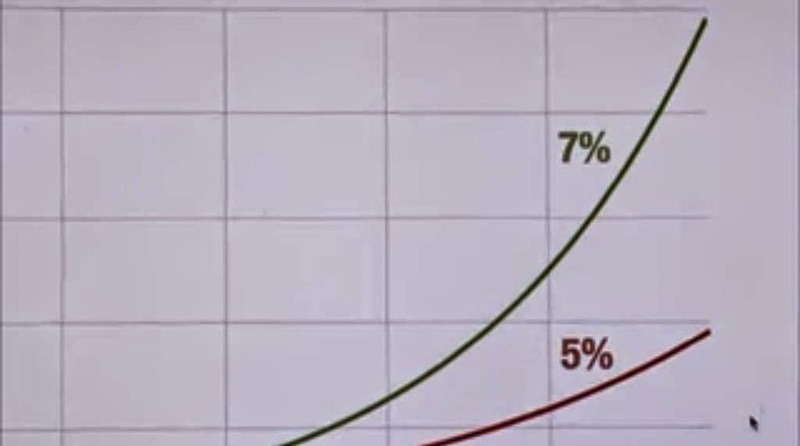 Over 50 years, the difference between your net of 5 percent - the red line - and what you would have made without fees - the green line - is staggering. Bogle says you've lost almost two thirds of what you would have had. JOHN BOGLE: What happens in the fund business is the magic of compound returns is overwhelmed by the tyranny of compounding costs. It's a mathematical fact. There's no getting around it. The fact that we don't look at it- too bad for us. MARTIN SMITH: [on camera] What I have a hard time understanding is that 2 percent fee that I might pay to an actively managed mutual fund is going to really have a great impact on my future retirement savings. JOHN BOGLE: Well, you have to rely on somebody to get out a compound interest table and look at the impact over an investment lifetime. Do you really want to invest in a system where you put up 100 percent of the capital, you the mutual fund shareholder, you take 100 percent of the risk and you get 30 percent of the return? These same mathematical investment facts also apply to pensions of private companies and public employees although the risks and responsibilities for management of them and the costs have not been shifted over from the employers to the employers in the same way. These mathematical investment facts apply to Blackstone and in the case of public employee pension funds, it's our elected officials like our state and city comptrollers who are responsible for making the decisions about what fees like this are to be paid to companies like Blackstone. On the Political Inside- "Pay to Play"
More than two dozen firms that have surfaced in a broad corruption investigation of public pension funds gave at least $1.97 million in campaign contributions to officials with potential influence over the funds' investments, a USA TODAY analysis shows. The givers included private-equity giants such as the Blackstone Group, the Carlyle Group and the Quadrangle Group, the firm founded by Steven Rattner, who in July resigned as the White House point man for the auto industry rescue. The contributions are legal, and the firms haven't been accused of wrongdoing related to the giving. Officials of the Blackstone Group have similarly contributed to pension fund incumbents and candidates. The firm's chairman is co-founder Stephen Schwarzman, a former Lehman Bros. executive. Co-founder Peter Peterson retired as Blackstone's senior chairman in 2008. Campaign finance records show Schwarzman; his wife, Christine; and Peterson gave a combined $30,000 to three candidates who ran in 2002 to succeed H. Carl McCall as state comptroller. Hevesi, the winner, got the most, $21,000. Separately, McCall received $25,000 from Christine Schwarzman for his unsuccessful bid for governor. Blackstone has received about $1.74 billion in private equity- and real estate-related investments from the New York pension fund since 1993 and has been paid about $20 million in fees, said Whalen, the state comptroller's spokesman. The firm has not been accused in the New York investigation. See also Crains New York Business: Private equity donations to politicians uncovered- Staffers of firms gave money to officials with power to steer pension funds to range of investment advisors, by Hilary Potkewitz, August 28, 2009. New York Attorney General Andrew Cuomo has been investigating pay-to-play accusations involving the state's pension plan and various investment funds, including Carlyle, for the past year. In June, the Carlyle Group agreed to pay a $20 million settlement, and change company policy to limit employee political contributions to $300. Blackstone has not been accused of anything as a result of Mr. Cuomo's investigations. A Blackstone spokeswoman said that since at least 2006, the company has had a policy prohibiting employees from donating to campaigns for offices with direct oversight of public pension funds. That policy also requires approval from its general counsel for any campaign contributions. And see, Final Alternatives Hedge Fund and Private Equity News: Ex-Blackstone Employee Pleads Guilty In N.Y. Kickback Scandal, May 13 2009. A former employee of a placement agent now owned by the Blackstone Group has pleaded guilty to securities fraud as part of the widening kickback scandal at a New York State pension fund. Putting this again in the context of the debilitating fees already discussed, we come across this article from the New York Post that ran four years ago during the last election for state comptroller. Harry Wilson, the Republican candidate running for office against Democrat Thomas DiNapoli (who won and is now running again) likely knew what he was talking about because he was a former Blackstone principal. See: A pension to slash, by Josh Kosman, August 1, 2010. The former Blackstone Group principal who is the Republican candidate for New York State Comptroller believes the state should consider decreasing its allocation to private equity in its pension funds. Most PE firms, he said, do not outperform the S&P 500 after fees. "I'm not a big believer in alternatives," Wilson told The Post. "I don't own a lot of alternatives in my portfolio." "To outperform the markets is hard and then when you charge large fees on top of that it is really hard." The state as of March 31 had 9.3 percent of its $133 billion invested in private-equity funds, and another 9 percent in other "alternative investments" like real estate and hedge funds. Maybe candidate Wilson had a change of heart after leaving Blackstone but indications are that for those at Blackstone their heart is not in benefitting the pensioners; the job they are being paid enormous fees to do. Blackstone’s Byron Wien, vice chairman of New York-based Blackstone's advisory group, said retiree benefits were "too generous." "The retirement benefits for state workers, really not only in New York, California and New Jersey but throughout the country, are very generous, too generous," Wien said in response to a question about U.S. state budget deficits during a Jan. 5 presentation of his forecast, according to a transcript. "We literally can't afford the benefits we have given our retirees in state and local governments and we have to change that." Wein’s remarks sound very much like Goldman Sachs CEO Lloyd Blankfein when he said that the public was going to have to lower its expectations about “entitlements and what people think that they're going to get. Because they're not going to get it.” It has been suggested that Mr. Blankfein should, like Mr. Schwarzman, be made one of the trustees to whom we entrust the care of our New York City libraries. What did Stephen Schwarzman say in response to Mr. Byron’s remarks and the objections that consequently arose? "Byron will play a central and invaluable role in providing direction and guidance,"
While Mr. Wien's heart doesn’t seem to be in helping pensioners, he may also lack the talent that would entitle him to take fees to do so. See: Byron Wien's Atrocious "Forecasting" May Have Cost Blackstone Hundreds Of Millions, by Tyler Durden on 01/06/2011. While politically luring public pension funds into underperforming high-fee investments is one form of public asset stripping, New York’s pensioners may also be chagrined to learn that the funds they had invested with Blackstone entailed another layer of public loss, one that U.S. Senator Charles Schumer was duty bound to complain about when it came to light. During the Democratic Convention in the 2012 presidential race Bain Capital was excoriated for jobs it was said to have destroyed in corporate takeovers. Blackstone engages in the same sort of dismantling of jobs and companies so, by investing in Blackstone, New York’ pension funds (two New York State public employee pension funds and four New York City pension funds) were causing jobs to be lost in Fulton, New York. A Birds Eye Foods factory was ultimately closed by Blackstone's subsidiary after the union’s and Senator Schumer’s fruitless protests. See Bloomberg’s: Pensions Find Private Equity Bites as Blackstone Cuts Job, by William Selway and Martin Z. Braun, February 23, 2012 and the very similar, slightly truncated Pension and Investments: NY pension funds find private equity controversy as Blackstone cuts jobs, by Bloomberg, February 23, 2012. The new owners, Pinnacle Foods Group LLC, a company held by the private equity firm Blackstone Group LP (BX), [“the world's largest buyout firm”] closed the factory and fired 270 workers. Kimber, 64, got eight weeks severance for her 12 years on the job and lives with her 37-year-old unemployed daughter in the rust-belt town of about 12,000, northwest of Syracuse. Private equity executives, including Blackstone managing director and Pinnacle Foods director Prakash Melwani, have helped stock Romney's campaign war chests. New York Comptroller Thomas DiNapoli, the sole trustee of New York's $140 billion retirement fund, declined to comment. New York City Comptroller John Liu declined to comment. John Cardillo, a spokesman for New York state's Teachers' Retirement System, declined to comment. In January 2010, U.S. Senator Charles Schumer, the New York Democrat, held a press conference with workers in Fulton, saying he would keep pressuring the company until all the jobs were safe. Schumer said he called Stephen Schwarzman, Blackstone's chairman and co-founder, and asked him to spare the factory. New York's pension funds do not wish to be investing in job loss or in a global `race to the bottom. "What you're doing by doing that -- you are systematically eliminating the middle class," he said. "You're going to be rich or you're going to be poor. There's no in between." 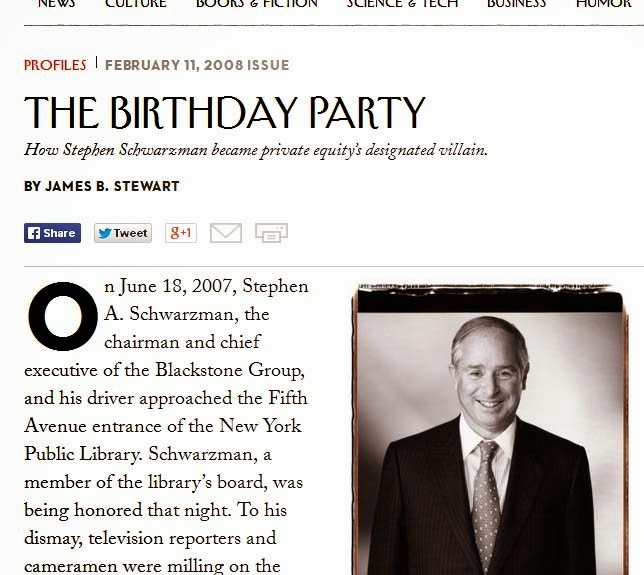 Blackstone, and especially Schwarzman, was also openly going after and championing yet another level of fees that would sap pension fund investments, “placement agent fees.” When I was in government with the state finance agencies we were confronted by firms that, with political introductions, proposed that they should be inserted as a new level of intermediary between the finance agencies and the investments they made, getting yet another set of fee for its `advice’ or `guidance.' Unable to discern any value to the proposal or actual expertise being offered we turned them away. “Placement Agent Fees,” paid by pension funds generated considerable controversy and a challenge from the SEC. For years, the easiest way companies could get contracts to manage billions of dollars for the pension funds for either New York City or New York State was to go through the local influence peddler. It was a recipe for big corruption, especially in Albany. Both the city and state stopped using placement agents last April after two top advisers to Alan Hevesi, the former state comptroller, were charged with corruption and violation of federal securities law relating to their "private" work as placement agents. The two pleaded not guilty and are expected to go on trial soon. Another four fixers from the Hevesi era have pleaded guilty to securities fraud. And a California manager of a venture capital fund pleaded guilty in December to giving out nearly $1 million in illegal gifts to New York State officials to get contracts with the state pension fund. State Comptroller Thomas DiNapoli said Thursday that the ban on placement agents is working well in Albany. He said it had made the investment process more transparent and helped new and smaller firms compete. So, The Times asks, why is Mr. Liu going in the opposite direction? Not quite two weeks later, Schwarzman was granted space in the Times to personally respond to the editorial. He was arguing to support the position that Comptroller Liu has taken, that placement agents should be regulated, not banned, a position that would permit Blackstone to continue to ply its trade with New York pension funds as one of the four largest placement agents. See: Another View: In Defense of Placement Agents, By Stephen A. Schwarzman, March 4, 2010. The four largest placement agents are part of major financial institutions in New York - Credit Suisse, UBS, Lazard and the Blackstone Group - and the professionals are federally registered and the firms themselves are heavily regulated. We do extensive due diligence on any manager we seek to represent (Blackstone's Park Hill Group takes as clients about 5 percent of the managers who come to it). We also prepare marketing materials and then take them before the major sources of investment capital - private, state and local pension plans; university and foundation endowments; sovereign wealth funds; etc. - to make the case as to why these managers warrant an investment. Most of these managers could not get a start in business without placement agents. It is probably not to Comptroller Liu’s credit that he aligned with Schwarzman on this issue. The alignment may have also put Liu in an interesting position when, three years later in the spring of 2013, Liu stepped up to oppose the sale and shrinkage of libraries with their attendant questionable real estate deals that Schwarzman was pushing for as a trustee of the NYPL. The SEC in May 2009 proposed the outright banning of placement agents , which in New York, California, New Mexico and Kentucky, were the conduit for corruption in those states' public pensions. However, the Private Equity industry was able to kill this SEC proposal, I believe by getting the Obama administration to pressure the SEC to water down this ban. Blackstone's billionaire founder, Stephen Schwarzman, personally sent a letter to the SEC opposing a placement agent ban. Their legal obligations are detailed in private equity documents that are confidential and off limits to pensioners and others interested in seeing them. The Sunday Times article makes it clear that Carlyle passed this loss along to New York City pensioners and that Comptroller Stringer's remark applies to them. When I asked whether the Blackstone was, or might be similarly passing its loss along to New York City pensioners I was quickly informed that the investigation is ongoing so that this information could not be furnished. I put this question to the State Comptroller’s office at the same time and have yet to receive a response. "Hundreds of billions of public pension dollars have essentially been moved into secrecy accounts," said Edward A.H. Siedle, a former lawyer for the Securities and Exchange Commission who, through his Benchmark Financial Services firm in Ocean Ridge, Fla., investigates money managers. "These documents are basically legal boilerplate, but it's very damning legal boilerplate that sums up the fact that they are the highest-risk, highest-fee products ever devised by Wall Street." Retirees whose pension funds invest in private equity funds are being harmed by this secrecy, Mr. Siedle said. By keeping these agreements under wraps, pensioners cannot know some important facts - for example, that a private equity firm may not always operate as a fiduciary on their behalf. Also hidden is the full panoply of fees that investors are actually paying as well as the terms dictating how much they are to receive after a fund closes down. A full airing of private equity agreements and their effects on pensioners is past due, some state officials contend. The urgency increased this year, these officials say, after the S.E.C. began speaking out about improper practices and fees it had uncovered at many private equity firms. 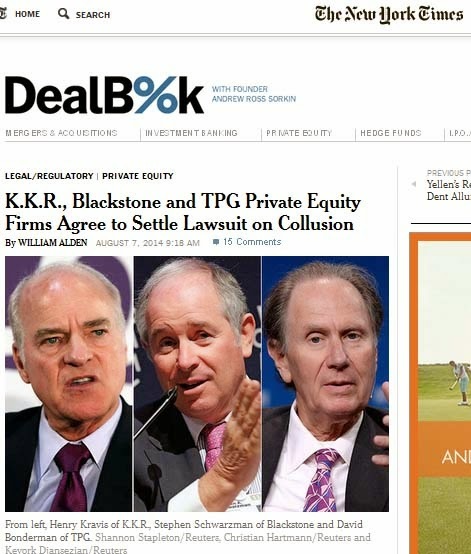 Private equity giants like the Blackstone Group, TPG and Carlyle say that divulging the details of their agreements with investors would reveal trade secrets. Pension funds also refuse to disclose these documents, saying that if they were to release them, private equity firms would bar them from future investment opportunities. On the very questionable absence of oversight by the public's elected officials making these investments the article quotes attorney Karl Olson, a partner at Ram Olson Cereghino & Kopczynski, who has sued he California Public Employees' Retirement System, to disclose fees paid to hedge fund, venture capital and private equity managers. "I think it is unseemly and counterintuitive that these state officials who have billions of dollars to invest don't drive a harder bargain with the private equity folks," he said. "A lot of pension funds have the attitude that they are lucky to be able to give their money to these folks, which strikes me as bizarre and certainly not acting as prudent stewards of the public's money." Regulations require that registered investment advisers put their clients' interests ahead of their own and that they operate under what is also known as a fiduciary duty. This protects investors from potential conflicts of interest and self-dealing by those managers. This is true of mutual funds, which are also required to make public disclosures detailing their practices. But, as a lawsuit against Kohlberg Kravis Roberts shows, private equity managers can try to exempt themselves from operating as a fiduciary. "On one hand they say they don't owe you the duty," she said, "but everything is so confidential with these investments that without a court order, you don't have any idea what they're doing. It's not open and transparent, and that's the kind of structure to me that's ripe for abuse." . . a simple investment in the broad stock market trounced private equity. For the five years through March, for example, private equity funds returned 14.7 percent, annualized, compared with 21.2 percent for the S.&.P. 500. One-year and three-year returns in private equity have also lagged. And given the complicated calculations about who gets what monies in transactions, with the managers first in line, the investors always waiting to find out what they finally get, how late in the game after final reckonings would one know how bad, bad news is? You can’t always get out of a hedge fund investment exactly when you’d like and when funds face liquidity problems they sometimes restrict withdrawals. Madoff, of course, broke laws and a fairly high proportion of his victims were wealthy. However, as must be noted with increasing frequency in our society, when it comes to the ways that the wealthiest use tilted playing fields to their advantage at the expense of others, the crime is not what activities are against the law, the crime is what is legal. That’s the context in which this nation’s “plutocracy” is better understood as a "kleptocracy." Laws can change. Practices described here are in many ways similar and analogous to the kinds of abuses with respect to credit card and consumer lending, “tricks and traps” that Elizabeth Warren and new consumer regulations are working to proscribe. In a report on the SEC's findings after a preliminary round of examinations, agency official Andrew J. Bowden described what he called a "remarkable" level of lawbreaking and cheating among the 150 private equity advisory firms inspected so far. Bowden delivered his report directly to the lions in their den, speaking at a May 6 private equity conference. "A private equity adviser is faced with temptations and conflicts with which most other advisers do not contend," Bowden stated. "We have seen that these temptations and conflicts are real and significant." The most striking statistic: Half of all examinations uncovered "what we believe are violations of law or material weaknesses in controls." The New York Times article about high fees was preceded by several months by a thorough article addressing the subject that appeared in the Financial Times apparently sparked by the SEC investigation: Private equity: A fee too far- Regulators are probing conflicts of interest and high fees charged by fund managers to the companies they own, by Anne-Sylvaine Chassany and Henny Sender, July 13, 2014. Even though these fees are increasingly refunded to investors, prominent institutions including some top university endowments are reluctant to back the most high-charging fund managers. "They have come up with a formula to enrich themselves more than their investors," says the chief of one leading US endowment. The Financial Times article also examines ways that tax considerations contort private equity practices and funnel preferential benefits, another reason to close the kinds of loopholes that Schwarzman so watchfully protects. Things may be coming home to roost, and there is one more sign that institutional investors, as the Times reports, are walking away from these deals more often: At the September 17, 2014 NYPL trustees meeting, home turf for Schwarzman, the trustees were told that the NYPL was implementing a shift in the last couple of years to take risk out of the portfolio, simplify and reduce fees. Nevertheless, with 72% of its portfolio in public common stocks it still has 15% invested in alternative investments like hedge funds and 10% in private equity and real estate. 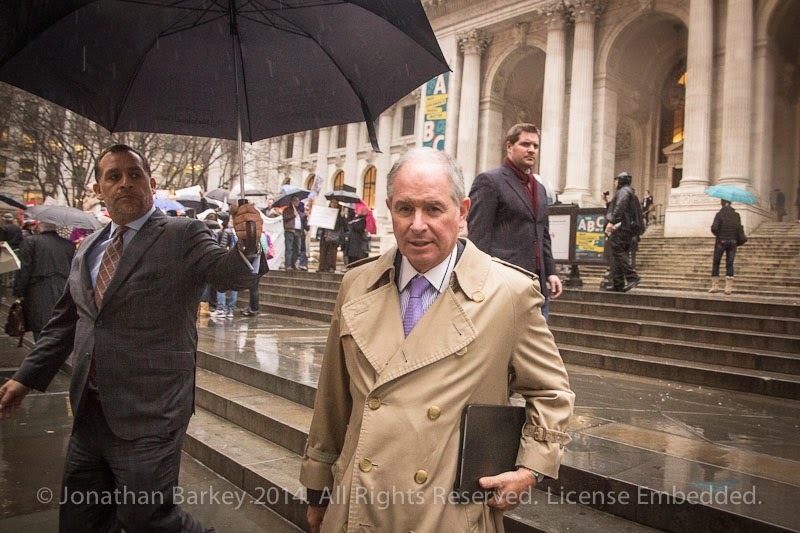 Stephen A. Schwarzman leaving an NYPL trustees meeting March 12th outside of which demonstrators gathered to oppose the sale, shrinkage and deliberate underfunding of libraries. Photo by Jonathan Barkey. Are we being too hard on Mr. Schwarzman? Are we asking too many hard, too many unfair questions? Should we take less of a cue from, put less stock in how ostentatiously Mr. Schwarzman, himself, has declared himself to be antagonistically on one side of a class divide? Is it just that Mr. Schwarzman sets himself up as too much of a target when he proclaims himself in superlatives, saying that Blackstone is, among other things, the world's largest real estate investment firm, the largest owner of houses in the United States, one of the "four largest placement agents," the world's largest investor in hedge funds, the "world's largest manager" (with $88 billion in 2008 and $200 billion in 2013) of "so-called alternative assets, such as private-equity, real-estate, and hedge funds-esoteric vehicles" mostly on behalf of "corporate and public pension funds, endowments of universities and other nonprofit institutions, insurance companies" with investors that included "Dartmouth College, Indiana University, the University of Texas, the University of Illinois, Memorial Sloan-Kettering Cancer Center, and the Ohio Public Employee Retirement System."? . . had become the designated villain of an era on Wall Street-an era of rapacious capitalists and heedless self-indulgence that had driven the Dow Jones Industrial Average to new highs, along with the prices of luxury real estate and contemporary art, while the incomes of ordinary Americans stagnated or fell. Are there lines that just shouldn't be crossed when making making money? For instance, even if we believe that virtually, by definition, prisons should never be privatized and subjected to the profit-making motivations of incarcerating more people longer and for lesser infractions,* if prisons are privatized should it be off limits to invest in them? Are we too quick to hold NYPL trustee Schwarzman accountable for the debacle that was the sale of the Donnell Library or for the push for even more library sell-offs and shrinkage with the NYPL's Central Library Plan that, although the NYPL did not publicize it, would have involved public expenditures of over half a billion dollars? 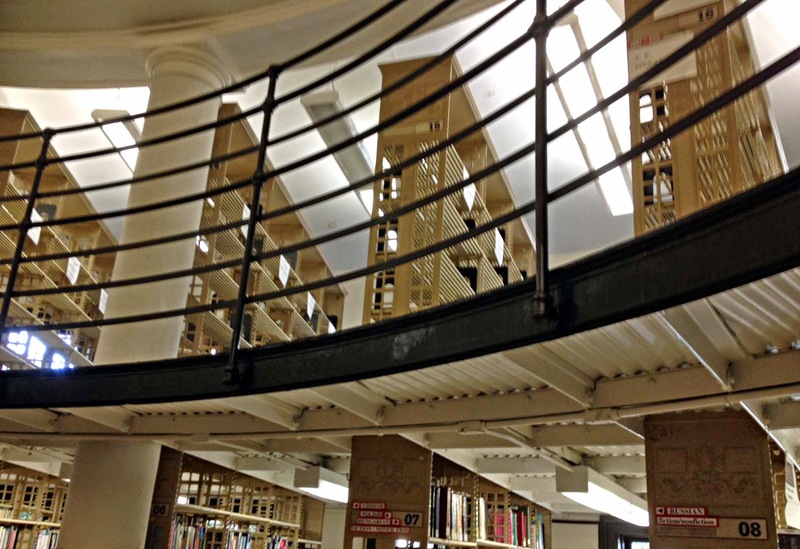 Mid-Manhattan and the 34th Street Science, Industry and Business libraries were to be sold while the research stacks of the Central Reference Library holding three million books were to be destroyed. I was once in New York, and I listened to a talk about the building of private prisons - a huge growth industry in America. The prison industry needs to plan its future growth - how many cells are they going to need? How many prisoners are there going to be, 15 years from now? And they found they could predict it very easily, using a pretty simple algorithm, based on asking what percentage of 10 and 11-year-olds couldn't read. And certainly couldn't read for pleasure. Mr. Schwarzman is not the only plutocrat who invests in such anti-social, currently money-making activities as hydro-fracking, with all its myriad long-term pollutions, toxins, water usurpation, radioactivity, earthquakes . . When it comes to the ravaging the entire planet for the benefit of a few with the promotion of more fossil fuel use that will significantly bump up the effects of global warming, Schwarzman isn't likely to catch with the Kochs brothers, or even just David. Brother David lives in the same building as Schwarzman, 740 Park Avenue, now an infamous symbol of wealth, income and political inequality with assists from Alex Gibney's documentary “Park Avenue: Money, Power & the American Dream”* and the book that preceded it, "740 Park: The Story of the World's Richest Apartment Building," by Michael Gross. David Koch who, with his brother Charles have also been attacking universal national healthcare, seems to has his name ubiquitously on everything these days despite such other anti-social activities as financing climate science denial. Why should we then care or consider it inappropriate that Mr. Schwarzman's name should have appeared on the NYPL's 42nd Street Central Reference Library that would have been so ruined by the real estate deal oriented shrinkage plans he supported? I think the answer is that it isn't just Mr. Schwarzman and his activities we should be objecting to and even though we are not, per se, talking the 1%, (actually the top tenth of 1%, .01% of all Americans) where an increasing imbalance of wealth is piling up, there are multiple other individuals we should be concerned about in that elite and exclusive group. . .
. . . Maybe it can be argued that putting David H. Koch's name on ballet theaters, NOVA Science episodes, hospital centers, or new oil-black public fountains outside the Metropolitan Museum of Art (weren't we better off with the old fountains and plaza?) somehow ameliorates the fact that we are trading in our environment, probably together with the planet's future, by letting Charles and David pursue ever greater wealth in whatever manner they choose. Maybe it can also be argued that, in this besieged world where the middle class is already being squeezed out of existence with the spoils divided up, pension funds are best off partaking in dismantling the jobs of other workers in their state to curtail losses. (That argument is suspect, however, if these equity funds don't even keep pace with the broader stock market). . . .
. . . Nevertheless, does it make sense for us as a society to be signing on to losing propositions that shuffle wealth upwards and then content ourselves with these booby prizes as consolation? Unless we are all in abject surrender mode, isn't it time to remove David H. Koch's name from all those public properties to which he has affixed it and remove Stephen A. Schwarzman's name from the NYPL's 42nd Street Central Reference Library? Thereafter shouldn't we put a halt to the anti-social activities that have financed such ill-advised public honorings whether they be Mr. Koch's, Mr. Schwarzman's or anyone else setting such lamentable examples? “We’re Starting From Scratch!” Says Developer Getting Brooklyn Heights Library Site- So How Tall Luxury Building Replacing Library Will Be And What It Will Look Like Is Unknown! The big, takeaway-with-a-gasp headline from the Tuesday, October 7th “Community Advisory Committee” meeting about selling and shrinking the Brooklyn Heights was that the developer said that he couldn’t say how tall the luxury tower replacing the Brooklyn Heights Library will be or what that building will look like, because, now that his company has been awarded the bid for the library site, they are “starting from scratch . . just beginning” and that he could “now shamelessly steal” from his competitors to design what might actually be built. Invisible Dog, Invisible . . . .
Ergo, a tricky feat was managed: While the CAC meeting had aspects of a dog and pony show where Brooklyn Public Library President Linda Johnson and cohorts were self-congratulatorily announcing their plans with an odd sense of certainty and inevitability, there was a certain invisibility to both the dog starring in the show (a library proposed to be vastly shrunken) and the pony (the luxury tower). Version of Proposal F released by the BPL- Without the Saint Ann's development rights included to make it taller? 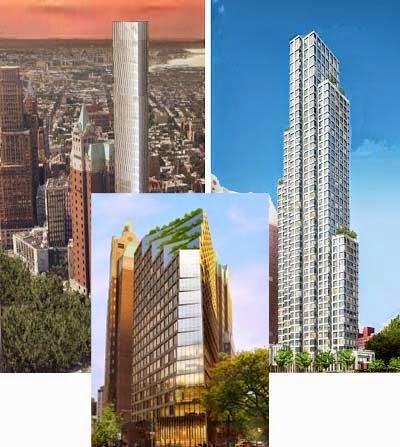 How tall might the luxury tower be and what might it look like? If David Kramer and his Hudson Companies are stealing shamelessly from his competitors that means that anything that was previously possible or under consideration is still possible and under consideration. It means the tower might, in height, be the equivalent of 45 to 55-stories. That’s what was being looked at in terms of “Proposal F.” See the analysis done of all the previously competing designs when they were presented: Monday, December 16, 2013, Tall Stories- Buildings Proposed To Shrink The Brooklyn Heights Library: Brooklyn Public Library Publishes Seven Luxury Building Proposals To Shrink Away Brooklyn Heights Library. 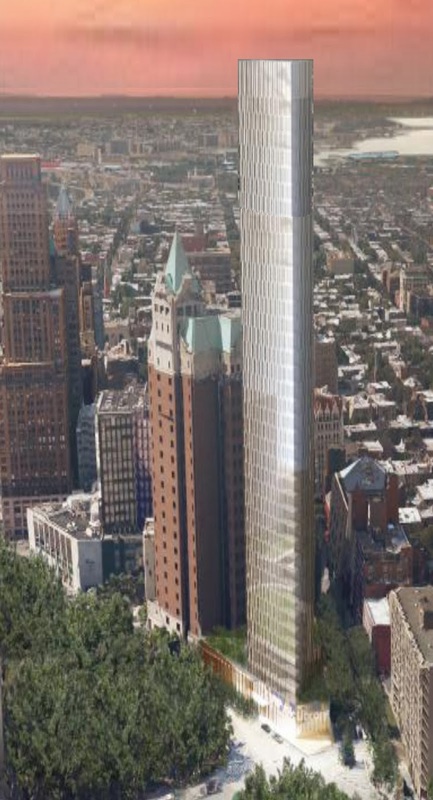 There is an incentive for the developer to make his building as tall as possible that was highlighted in the Request For Proposals (RFP) that the BPL and New York City Economic Development Corporation issued that touted to developers the benefits of buying the library site. The site enjoys park views to the east with the prospect of achieving views of Manhattan and Brooklyn skylines, as well as of the New York Harbor and bridges. By making two choices the developer increases the number of luxury apartments that will vault into the heavens high enough to see over the rest of the neighborhood and across the harbor: 1.) make the building tall and skinny, and 2.) go with extra tall floor to floor/ceiling heights. Each of these choices is all the more likely to be the developer’s strategy in the New York City market where an increasingly large part of the city’s luxury condo ales are comprised of what a New York Magazine cover story referred to has high-end “stash pads,” apartments that are pitched, largely to foreigners, as money-sponge assets, ways to soak up and park illegally obtained or ill-gotten gains now that new post-9/11 laws prohibit Swiss bank accounts from performing the functions they formerly did. See: Stash Pad- The New York real-estate market is now the premier destination for wealthy foreigners with rubles, yuan, and dollars to hide, (Why New York Real Estate Is the New Swiss Bank Account), by Andrew Rice, June 29, 2014 and (from the International Consortium of Investigative Journalists) Hidden in Plain Sight: New York Just Another Island Haven, By Michael Hudson, Ionut Stanescu and Samuel Adler-Bell, July 3, 2014. 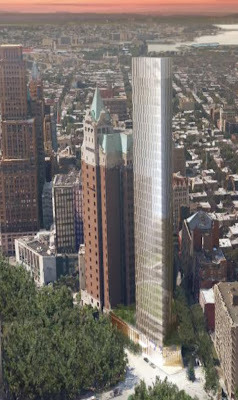 Image that appeared in the New York Times and elsewhere as if the developer wasn't "starting from scratch" and incorrectly reporting that the tower would be "20 stories"
Asking how tall the new luxury tower might be or what it would look like might have seemed a somewhat stupid, time-wasting question when it was asked, given that when the BPL issued its press release about the selection of a developer an image of a building submitted with the developer’s proposal circulated and appeared in all the press reports including the New York Times. The question, in fact, was far from foolhardy given the developer’s response. Another reason it made sense to ask? : After the BPL press release and press conference announcing the developer’s selection there were reporters, including for the New York Times and the Brooklyn Paper, who got the misimpression that the tower would only be 20 stories tall, The information was incorrectly reported with corrections needing to be made later. You also can’t trust pictures that developers release to promote their projects as really being reflective of what the buildings will look like in relation to their environs. Right now Forest City Ratner is taking lumps for new project renderings that obviously distort, trying to make proposed new Atlantic Yards (aka “Pacific Park” as euphemistically renamed) mega-project buildings look smaller. See these two recent articles: Friday, October 10, 2014, 550 Vanderbilt condo renderings fudge transition from row houses to tower; building marketed along with Nets in China and Tuesday, September 02, 2014, Playing with perspective: how renderings suggest new 18-story tower (smallest of all) almost harmonizes with row houses. And see these older articles: Wednesday, December 18, 2013, What's wrong with this picture? Atlantic Yards B2 rendering skews several perspectives, suggests clock tower, Friday, September 26, 2008, Weighing Scale, and Thursday, September 10, 2009, The Surrounding Light Smears Ratner's Atlantic Yards Arena. A taller version of Proposal F if Saint Ann's and Ratner development rights were used? Lastly, another reason to wonder about how tall and large the building actually built might be is that none of the seven renderings previously presented to the public showed the development using all of the available development rights. . . . . Six of the seven did not show development using the substantial development rights that Saint Ann’s, the private school on the same block (on the other side of the Forest City Ratner building) will transfer in when its zoning lot is joined with the Ratner zoning lot, as the library property is already joined. From recent details released (the fact that Saint Ann’s is getting a new gymnasium out of the transaction and has been briefing its faculty on the benefits of the library sale and shrinkage for Saint Ann’s) it seems clear that this developer is, now at least, doing business with Saint Ann’s. But did the developer’s original proposal reflect that fact? 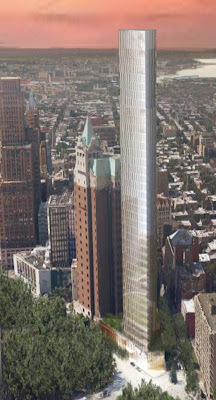 If so, then “Proposal F” by another developer depicting the tallest of the proposed towers was a depiction that didn’t already include the Saint Ann’s development rights, a proposal that when stolen “shamelessly” can be much taller when the Saint Ann’s and unused Ratner rights are transferred in. Here is exactly what the developer said about how the building could be just about any size or shape when was asked about how tall, how many stories the luxury building would actually be. So we’re sort of starting from scratch and trying to figure it out. And you know we have different options. You can have a taller slender building. 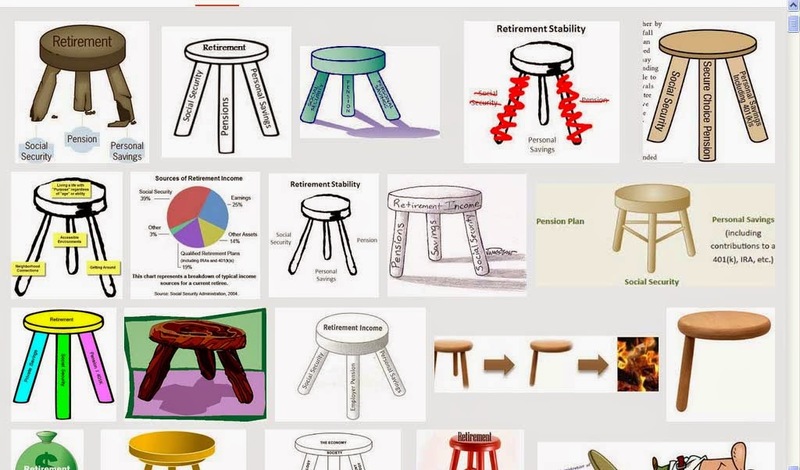 You can have a shorter squatter building. Uhm, and so we are going to look at different options. So, right now, we’re sort of. . uhm,. .. we’re just beginning. We have scratch paper and we haven’t finalized uhm, either the floor to floor height for any individual apartment or the shape of the building. And, in fact, you know an interesting dynamic is we can now shamelessly steal from all our competitors. There were fourteen proposals and seven finalists. I got to see six other designs. Some of them are good friends of mine and I asked if I could go, you know, take a look at their proposal and they greet my request with a combination of anger and (laugh) friendship, uhm . . .and uhm. . the BHA had good and bad things to say about those seven proposal and we sort of want to, uhm. . . you now, think about it, and see what people like, and what we like, and you know- You don’t want to have it designed too much by committee, a camel as the joke goes, . . . But, uhm, we want to. 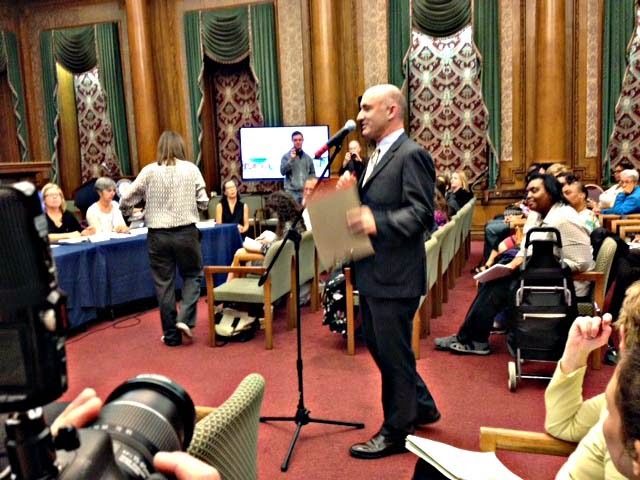 uhm, take a little time to figure it out.
. . . the evening's presentation confirmed that BPL has crafted a well-thought out and realistic proposal to replace an aging but extremely popular local library at one of Brooklyn's most expensive real estate addresses. How can there be any confirmation that the “BPL has crafted a well-thought out and realistic proposal” when the developer said that now that he has been selected he will “start from scratch?” Further, how can the BPL size a drastically shrunken library and then decide what the design will be and ask for public input afterward? Just as what luxury tower we will get is a black box perfectly set up for bait-and-switches, we similarly know nothing about the library sale, shrinkage and so-called ”replacement” except for the exact size down to which the library is supposed to be shrunk, 21,000 square feet with 15,000 square feet above ground, down from a total 63,000 square feet of space owned and available to the public. . .
• What the BPL would net (if anything) in terms of available proceeds from the library sale (or in terms of overall value in the exchange). Might there even be losses? I asked at the CAC meeting for details about the first two unknowns bulleted above, but Ms. Johnson and the BPL did not provide that information for which Citizens Defending Libraries (of which I am a co-founder) has made the following outstanding request: Open Letter To Brooklyn Public Library President Linda Johnson. It says something about the abject imbalance of the BPL’s public priorities that while we as yet don’t know how big the developer’s luxury tower is, the one thing we do know is exactly how small a space the library would be shrink down to, even before consideration of what we will try to include in that space or carry over from what is presently publicly owned. 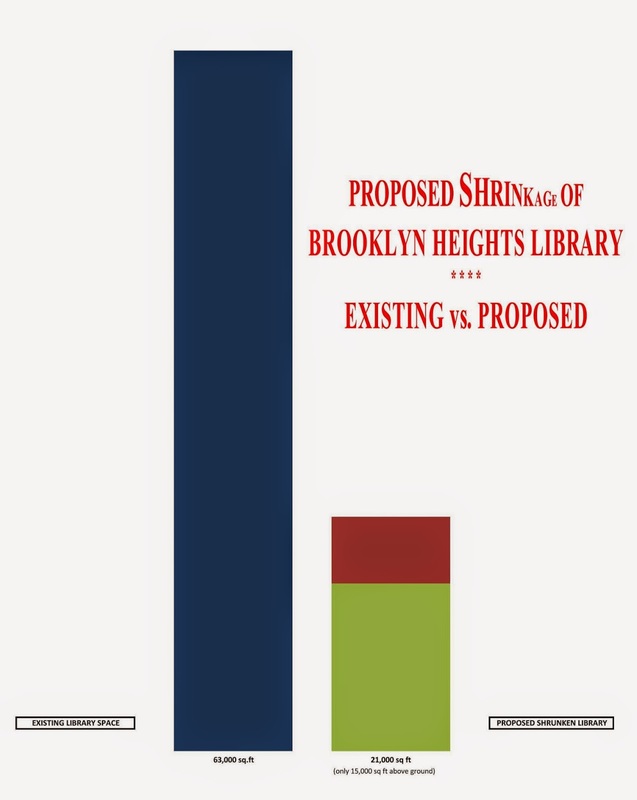 In simple bar graph form- The BPL is proposing to drastically shrink the size of the publicly owned space in the Brooklyn Heights Library from 63,000 feet (blue) to just 21,000 square feet (on left) of which just 15,000 square feet would be above ground. For more visuals that look more directly at the existing building and property to explore what the public would lose at the site in terms of the benefits it is familiar go HERE. Just 15,000 square feet of above-ground library space? The Brooklyn Heights Library is a central destination library, at least the second-most-important library in the borough, serving the downtown, and accessible to all residents of the borough, all residents of the city, in fact, at the borough’s most important mass transit hub for both subways and buses. The last time the BPL was going to create a new, central, destination library, in 2005 before the current library-shrinking and selling regime was instituted, it planned that a new Visual and Performing Arts Library across from BAM would be 150,000 square feet, ten times the size of what the BPL plans as the above-ground replacement library in the Heights. That’s extremely telling even if that 2005 plan might have sported some of its own boondoggle aspects. 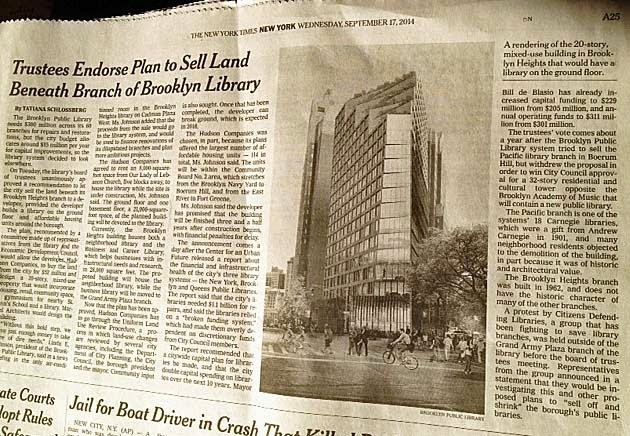 Set aside the BPL’s suspicious `not accessible to the public’ space calculations: The BPL’s premises for shrinking down the Brooklyn Heights Library and others, selling off their space, is really based largely on the idea of getting rid of physical books. Physical books take up real estate the BPL wants to sell. • The library would no longer endeavor to have robust browsable collections of physical books available to the public visiting libraries. Instead, a reduced collection of physical books, a “floating collection” would be available elsewhere, upon request. Doreen Gallo of the DUMBO Neighborhood Association is a member of the Community Advisory Committee, and was particularly eloquent about a number of matters during the evening’s meeting, including how, due to prior vetting, members of the CAC did not represent the community or its viewpoints. Gallo, herself, is an exception to that general observation. Ms. Gallo zeroed in on the disappearance of books from the libraries, noting how other libraries loved their books, and complaining about the absence of books from the library. She cited her visits to the Heights library with her daughter (written about in her open letter to Borough President Eric Adams) where it had taken nine to eleven days to obtain a books that they would originally have expected to find at the library when they went and, most recently, how requested books missing from the library had taken three weeks to obtain. Of course, no matter how long it takes to fulfill a request, the valuable “browsing experience” is eliminated. Later on in the meeting Johnson was criticized for not being a librarian and not having a respect for books. Indeed, Ms. Johnson talking about "crestfallen" librarians and book lovers has often been quoted in the press talking about how she sees the future of the BPL’s libraries as being largely bookless although she was previously advertising that books stored off-site would be available in "24 hours." When Jim Vogel, representing state senator Velmanette Montgomery, confronted Ms. Johnson about the absence of physical books Ms. Johnson offered somewhat lamely, "we can get very philosophical here about what it means to be a library" and said that she was sorry if people found her alternative vision for the library "mind-boggling." It's is sad to see the children’s section of the Brooklyn Heights Library with empty shelves as a result of Ms. Johnson work and alternative vision. 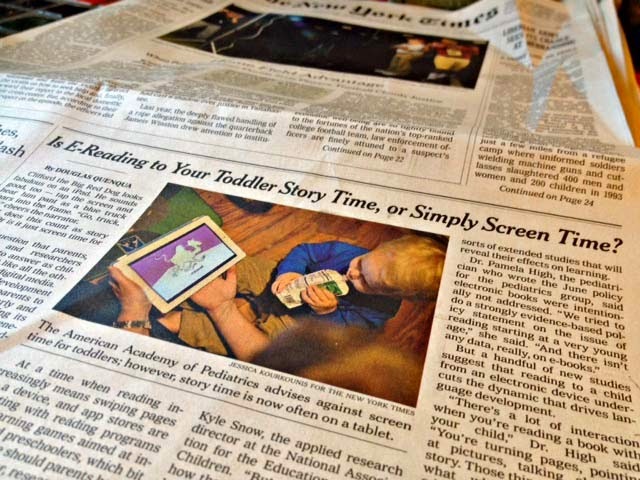 As fate would have it, the next Sunday, New York Times ran a story on its front page about new studies “that reading to a child from an electronic device undercuts the dynamic that drives language development.” See: New York Times: Is E-Reading to Your Toddler Story Time, or Simply Screen Time?, by Douglas Quenqua, October 11, 2014.- That’s basically in line with what a survey of the literature published in Scientific American was showing: The Reading Brain in the Digital Age- Why Paper Still Beats Screens (Why the Brain Prefers Paper), by Ferris Jabr, November 2013. Along with less space and far fewer books, the "replacement" library would, according to Ms. Johnson, have fewer librarians and a smaller staff. Ms. Johnson was asked whether the downsizing of the library would result in a reduction in the staff assigned at that location to serve the public. It was not surprising to learn from Ms. Johnson that a far smaller library would involve staff being cut. Ms. Johnson said that she did not know "the exact answer" to the question about how many people would be hired at the smaller library, that “the numbers have yet to be determined," but that her hope was that when built the "new building will be a model of efficiency" with a reduced staff that would not have to compensate for the drawbacks of dealing with a library that was of an "improperly" large size. Ms. Johnson almost made her less-is-more argument sound credible unless you stop to wonder whether libraries as places of exploration and discovery are really meant to to thrive on pared down efficiency. Is efficiency really always good and how much is it just another pretextual euphemism in this context? Pretty much across the board the proposal to sell and shrink the library was not well received. The opposition to the sale was not informed in advance that there would be an opportunity for the public to say anything or ask questions. 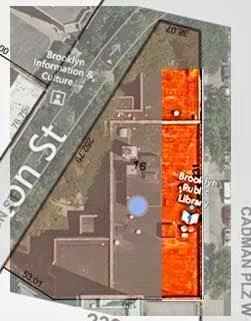 In addition to direct opposition, concerns were expressed about the paucity of dwindling public assets in the neighborhood, so that perhaps a shrinkage of the library would remove one more asset while PS8, the local public school, was still struggling to keep pace with too little space. 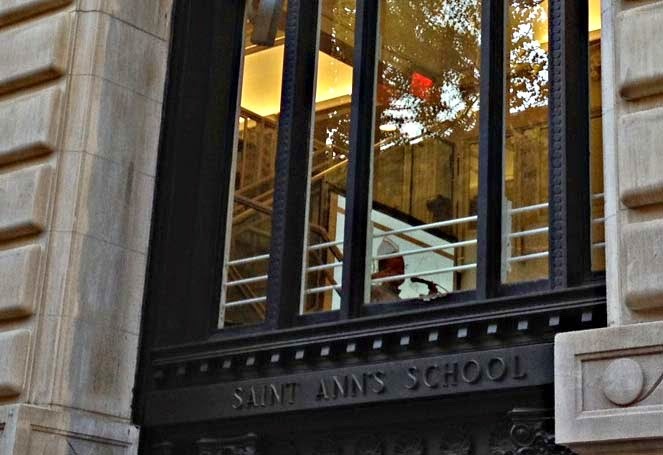 The developer's proposal would benefit Saint Ann's, a private school, but not the public school. The developer said he hadn't been asked to benefit the public in this way, and that if he were required to do anything more to benefit the public he would have wanted to pay less for the property. Reactions to the proposed sale and shrinkage were not universally, negative. There was an interesting scattering of individuals who maybe didn't use the library but had decided to come out that night ready to express their enthusiasm for civicly engaging in the workshops to design its replacement that Ms. Johnson was extolling, a replacement they were somehow already sure would be an improvement. At least one of these individuals wouldn't give her name afterward to an inquisitive reporter. Certainly, all of the people that got up to speak at the meeting are real people with real lives, but one wonders what to make of remarks made by some of them. One father who told a story about how his five daughters, hungry to read books from the library, reached the age of nine and then didn't want to go to the very "unappealing" library anymore so that as their father now, beseeched by them, had to run solitary, derring-do errand runs to fetch books. Speaking derisively of the library, he bet aloud to those assembled that nobody could name another building designed by its architect. I was standing behind him and named the Grand Army Plaza Library, also designed by Francis Keally. The BPL places no information about this up on its site, but Ms. Johnson then wanted to quibble about whether both libraries were designed by the same architect or only by his architectural firm. When others in the audience contradicted this speaker, saying that the library is, in fact, attractive the defended himself by saying, "not according to the library." There is a lot to be learned when we communally share our libraries as common assets. One fellow commented quizzically about the pronunciation of "Llama" he heard used at the library when "Llama Llama Red Pajama" (drawn and written by by Anna Dewdney) by was being read to children at the library. Llamas are domesticated animals in south America in countries where Spanish is spoken. This fellow heard the word Llama being pronounced with its original Spanish pronunciation ([ˈʎama] locally: [ˈʝama] or [ˈʒama]). Need to "Activate" Clinton Street? There is probably more to say, but maybe it is sufficient to conclude this report of the CAC meeting with one last thing that may have gone unobserved. The developer, promoting his development, said that Clinton Street, where the library is located, needed to be “activated,” asserting that this is something he knows because he walked his dog there four days a week and because it was something the Brooklyn Heights Association was calling for. He said his project would activate Clinton Street by having on either side of the entrance to the luxury residential tower “two small retail spaces”: a coffee shop and a space curated by “Smorgasbord” that would have rotating food vendors. Several incensed members of the community begged to differ about whether they believed this block of Clinton Street in fact needed to be "activated" or was actually better off the way it is now. Who knows, but certainly it must be in the developer’s mind that Jonathan Butler of the real estate blog Brownstoner is the Brooklyn Flea, is Smorgasbord, and that promoting Smorgasbord and giving it space could likely improve the press Mr. Kramer and his Hudson Companies development firm get in Brownstoner for all the projects Mr. Kramer wishes to push through in the future . . . .
. . . Which is to say, that when it comes to real estate development in New York City don't expect people in the industry to miss a trick- Something to remember whenever people in power are proposing that we should sell off our public assets.